If capturing text from your Arduino to a terminal buffer is all you want to do, you are lucky. You may want to collect data and use it in your own programs. Unfortunately there are not a lot of example programs to learn from and the 850 interface manual can be cryptic for us mortals. Persistence does pay off. Usually the “let’s try this” style of debugging will eventually get you to the proper combination of port settings and program logic. I wanted to hook up a sensor to the Arduino and then read the output through the RS232 port using Atari BASIC. I choose the ultrasound sensor. It will measure the time it takes a sound wave to travel from the sender to an object and back. If you know the speed of sound you can calculate the distance. Now you can imagine that by moving your hand in front of the sensor you can program the SOUND command to change pitch. You can imagine it but doing it may not be so practical. There are several manufactures of ultrasound sensors. Some will have 3 pins, some will have 4. Both have a +5 volt and GrouND pins. 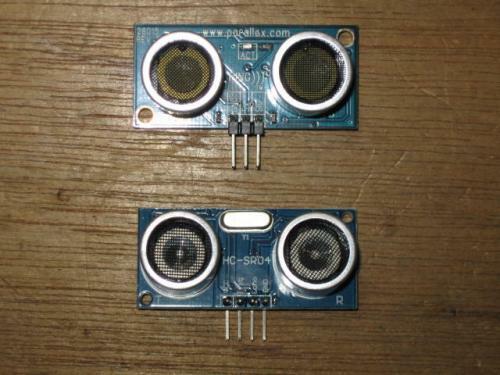 If the sensor has 4 pins, one will trigger the sound pulse and the other change logic states when it senses the sound. I am using the Parallax Ping))) sensor. One data pin is used as output to trigger the pulse. Before the pulse can travel back from an object the pin is set as input. 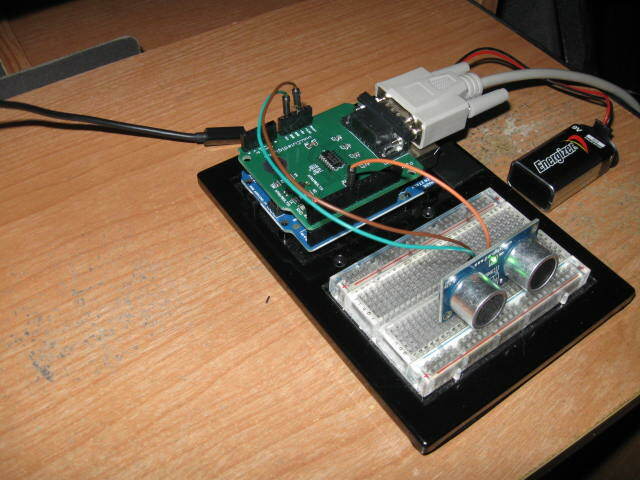 The Ping))) sensor was previously wired and running using an example program in “Arduino: A Quick-Start Guide”. Remember, the Arduino has to be programmed prior to installing the RS232 shield. The following program was uploaded, the RS232 shield installed and the Sensor was wired to pin 7, +5 volt and ground. The program can be tested by reading the input with a terminal program or the Arduino IDE through an RS232 port. Or, remove the shield and wire up the sensor, then read the data through the USB port. The first thing you may want to do is connect the Arduino to the 850 and read the data stream using a terminal program on your 8 bit. Be sure to set the baud rate at 9600. The first test program reads the data from the Arduino and prints out the text input and the value. Getting the SS$ into a floating point variable was a little more involved then INSS = VAL(SS$). The first problem was that a graphic character (CHR$(10)?) was placed at the beginning of the data. Not sure where it came from but it needed to be ignored. The second was knowing where the string ended. Line 105 and 110 were used to take care of this problem (most of the time). Now it was a matter of scaling the INSS variable for the SOUND command. That was easy but…….. it was not expected that the SOUND would turn off when the INPUT command was executed . I tried a few things to see if it would stay on but to no avail. This listing is just the last iteration that was tried. This last program simply uses a simple calculation to estimate the distance from the sensor to the object. It might come in handy for a security system or if you’re building a robot with an Atari brain. It was noted that every so often a string length error would occur. I would bet that when this happened the string variable SS$ was empty causing a length error when trying to read SS$(2,0). This was solved with the TRAP 100 command. Anytime an error occurred it would try again. In hindsight I might have started with a lower baud rate and picked another sensor. Optimization of hardware and software will have to wait for another day and another project. Atari DOS 2.5: 1050 Disk Drive Owner’s manual, Atari Corp. 1985, CO72033-001 Rev. A.